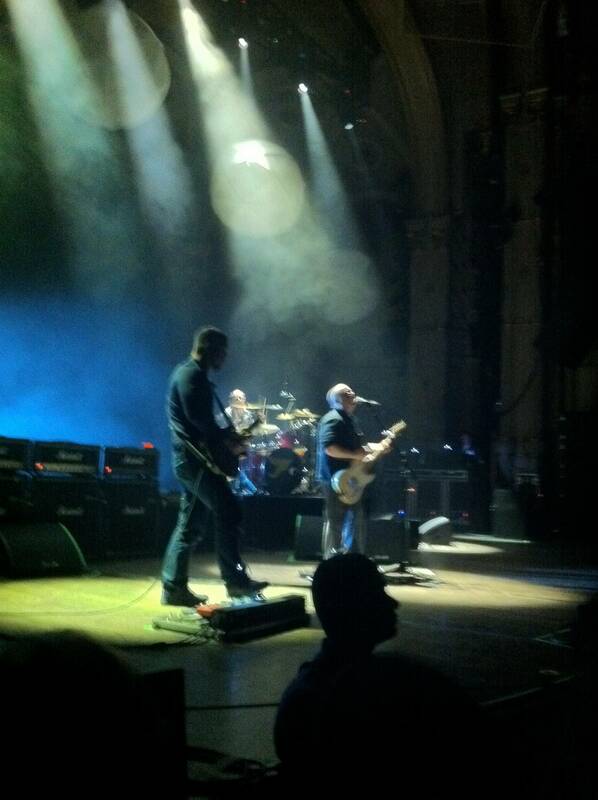 Pixies at Orpheum Theatre, May 3 2011. Terris Schneider photo. Last night, I got to see one of my favourite bands: The Pixies. All four original members, Black Francis, Joey Santiago, Kim Deal, and David Lovering performed the band’s classic 1989 album, Doolittle, and put on a helluva show. After playing three B-sides from the Doolittle era to start, The Pixies played the album in its entirety and in its original order. The stage set-up featured cool-looking ball fixtures hanging from the ceiling and, behind the band, a big screen displaying various video and image clips: old movie clips accompanied “Debaser”, but not the eyeball-slicing sequence, referenced in the song, from the Salvadore Dali/Luis Bunuel short film Un Chien Andalou. 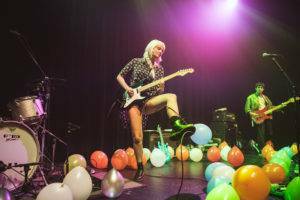 Other highlights of the show included “Here Comes Your Man”, “Monkey Gone to Heaven” “La La Love You” and “Hey”. During “Here Comes Your Man”, the screen featured close-ups of all four band members making funny faces. Frank Black’s expressions, with the singer in sunglasses and tongue hanging out, were the funniest. Drummer David Lovering dedicated “La La Love You” to all the ladies in Vancouver, and ended it by blowing a kiss into the audience. “Gouge Away”, Doolittle‘s last song, ended the set. The Pixies at the Paramount Theatre, Seattle, Nov 11 2009. Monet Lucki photo. 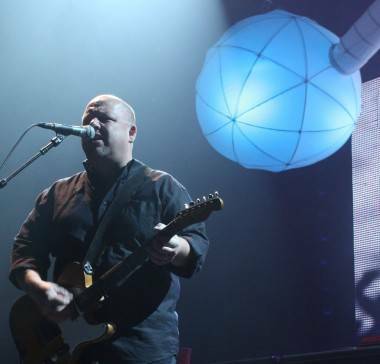 During the first encore, The Pixies returned for a second run at ‘Wave of Mutilation” along with another Doolittle-era B-side. The second encore featured songs from various albums and some crowd favourites, among them Neil Young‘s “Winterlong”, later-period Pixies tracks “Dig For Fire” and “Alison”, the early-period “Broken Face” and of course “Where is My Mind.” I was happily surprised that they didn’t finish the set with that latter song, made famous by the movie Fight Club. Instead, the show ended with a less obvious choice, the Kim Deal-sung song, “Gigantic”. At the end of the song, Deal said good night to each member of the band. It was a very endearing moment. The band members in general were very warm and friendly towards the crowd, and Deal made a super cool move by announcing that the Canucks had won their playoff game. By the second encore, the crowd’s cheering was so piercing, it was almost louder than the music itself. As I left the show, I heard a few fans say that they were going to go again tonight, and get scalped tickets. It would be well worth it. The Pixies play the Orpheum Theatre again tonight (May 4) in Vancouver. This entry was posted in concert reviews and tagged Pixies, Vancouver, Vancouver concert reviews, Vancouver concerts. Bookmark the permalink.